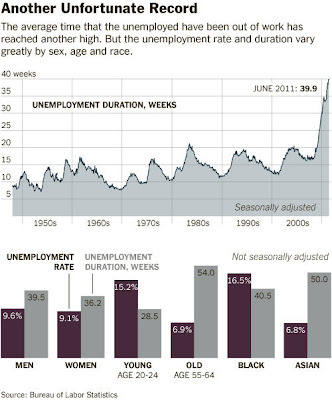 Interesting piece in the New York Times, on how the unemployed are apparently being shunned. If accurate, this is going to be a big problem as we move forward since we are at historical levels of long term unemployed. The unemployed need not apply. That is the message being broadcast by many of the nation’s employers, making it even more difficult for 14 million jobless Americans to get back to work. The practice is common enough that New Jersey recently passed a law outlawing job ads that bar unemployed workers from applying. New York and Michigan are considering the idea, and similar legislation has been introduced in Congress. The positions advertised ... cover jobs at all skill levels, including hotel concierges, restaurant managers, teachers, I.T. specialists, business analysts, sales directors, account executives, orthopedics device salesmen, auditors and air-conditioning technicians. 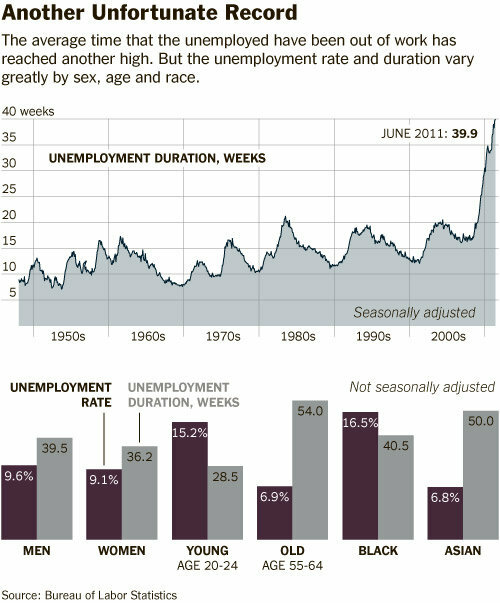 One consequence is that the long-term unemployed will rack up even more weeks of unemployment, Mr. Holzer said, and will find it harder to make the transition back to work.